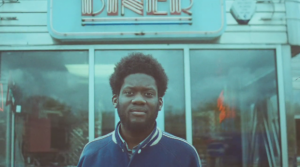 To want to listen to artist such as Michael Kiwanuka is always the hardest step for me. Why ? Because we already know that the media environment around the artist is going to call up on legendary names of black american music of the 60’s and 70’s for references often more to the artists than to the music. Because we already know that when it comes to the evolution of black american songwriting, medias seem to stop around the end of the 70’s, it makes it hard to actually want to listen. Being a black songwriter today does not mean the same thing that at a time where racism was just a normal and accepted concept by everyone. Not to say that everything is perfect today but luckily and with pain, black american music today does not need to have an extra social function, it just needs to be the music of an artist expressing himself. And that is what uk artist Michael Kiwanuka is doing : expressing himself, trying to define the limits of its soul through music, like a lot of other artist do. So keeping the analysis close to the nature of the subject and its direction, and bringing american music history heritage only when it is to see within the music the true influences seem to be a pretty acceptable thing to do. Now we have said that, we can tell you how much with enjoy the folk&soul songwriting of Mr Kiwanuka who seem to be able to mix a Beatles oriented sound, a contemporary song structure and some influence of the jazz black fusion songwriting arrangement with the presence of a flute. Perfect song for the end of a sunny day, we wanted to share with you a little joy from an artist who’s won BBC sound of the year 2012.